Home » content marketing » facebook » marketing » social media » video » How to use Facebook Live video like a pro. The essentials of getting it right. Live video is changing user consumption of news and entertainment and is further connecting TV and social media. More brands and news organizations are using live video to augment their digital reach.And, now Facebook Live is impacting the whole spectrum as a platform both for real-time storytelling and journalism. You cannot deny the awesome power of Live Video – if it's done right. With Facebook Live now jumping on the bandwagon alongside Periscope, Meerkat, and YouTube, how are brands going to benefit from this new here-and-now social media marketing channel? Facebook Live is pretty new for brands. Yes, the bigger brands have jumped on it, as have some smaller niche brands, but there are essential boxes you need to tick for your content to succeed in engaging your audience. 1. What are you going on Facebook Live with? What's the idea? Start with point one: Insight. In any form of digital marketing, consumer or customer insight is your first and most important step. First of all, is your audience going to appreciate the Live video format?Will it add value and enhance their experience? What's the kind of live content that your target audience wants. What resolution to their need or problem will you provide with your live video? You need to plan your live 'broadcast' around that. 2. 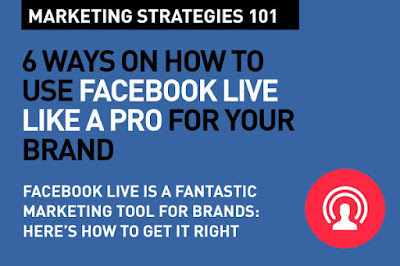 Prepare for your Facebook Live broadcast. Rehearse. Unless you are a seasoned broadcast journalist, you can't – or shouldn't – be wining it for a live broadcast. You'll need to prepare – your content, format, your set up, tools, your logistics etc. Facebook recommends that live videos last at least 10 minutes, but you can go up to 90 minutes. Your broadcast should be interesting and crisp. Plan the timing. Rehearse your content as much as possible – unless of course you are broadcasting an event, a launch or a seminar. Regardless, you should plan the length and bits of content that will go in. Plan your location. Lighting, ambient noise, how your phone will work (front or rear camera? ), who will hold the phone? These are important factors. Having a strong internet connection is critical. Don't settle for poor quality just because it is a live broadcast. Use the highest resolution setting possible, for example. Make sure your audio will come through clear and without surrounding disturbances. And most importantly, you should look and sound professional. Practice that. It’s nice to let your audience know ahead of time that they can expect a live broadcast from your brand. Tell them about the upcoming live video with your regular news feed posts. Create anticipation and hype. A live broadcast isn't something you do every day. If your live video is important enough, boost your announcement posts as paid Facebook ads. Use other social platforms that your brand is on to tell them about your broadcast ahead of time. To start your Facebook Live video broadcast, open the Facebook app and go to the personal, business, group, or event page that you want to target. On your phone, tap to create a new post and look for the Live icon at the bottom of the screen. Once you tap on the Live icon – provide a short description of your video. Make sure your description is precise, to the point and makes sense to your audience as well as to the search engines. More than anything, make this absolutely as interesting as possible. Of course, you know your content. You know what you'll be saying, you know how you will feed the interest of your audience. Relax. Be professional, smile, look engaged with your audience (rehearse this, over and again). Start by telling your audience a little about yourself, your brand, perhaps, and what you'll be broadcasting about. Beyond the initial description, this is what will hook them in and keep them watching. Encourage comments and feedback – while they are watching. That's how you increase their involvement, and their engagement with your content. Facebook Live allows your audience to provide feedback and ask you questions during the broadcast – live. They can click on the six emoji reactions that replaced the simple Like button. These appear for a few seconds onscreen – and you can keep an eye out for them. Facebook treats them the same as applause and boos on regular posts. End your live video broadcast with a call to action and tell them when they can expect more or where they could go for more related content. Ask them to share the archived copy of the video that will be in the timeline. Your broadcast gets automatically archived and gets posted on your timeline. Increase your engagement at this point. Thank your fans and your followers, remind them about your live broadcast, ask for comments and shares – increase the engagement right there. You are also able to add or change the location and date if you want, provide a longer description, update the thumbnail, and select a category at this point. Do this if you feel you can maximize the potential reach and engagement by tweaking meta data for example. Facebook provides useful feedback. You can see the total number of people who watched at least a portion of the video, along with a metrics of how many viewers you had at different points in time. You are able to see minutes viewed, people reached, total views (entire), 20 second views, unique views, reactions, comments, shares etc. This is valuable feedback to help you prep for the next broadcast. Was your content interesting enough? Did you sell your broadcast enough? Did you do your preparation right? Was it too long? Is your brand ready for the Live Video trend? How to use Facebook Live, Periscope, YouTube and Meerkat. Facebook is pushing Live Video big time. We know of the massive reach and engagement potential of live video as a format. It's important that you get the essentials right. And that's the basics. That's Digital Marketing Strategies 101. It will take time for most companies who use social media to be able to create winning content for FacebookLive. First of all it is not easy to create video content, secondly, this one is on your phone, meaning quality control and speaking interestingly at the same time is a difficult one to handle at the same time. These are good points to note, but there's a long way to go. Two forms of video - the 360° format and the Live format will soon be the most popular formats. People today like interacting with brand messages - so the 360° format is right for that. The Live video format is great for announcements and launches by brands, for example. It is also a great way to introduce people to people, and sometimes that really helps showing the people who work for brands.